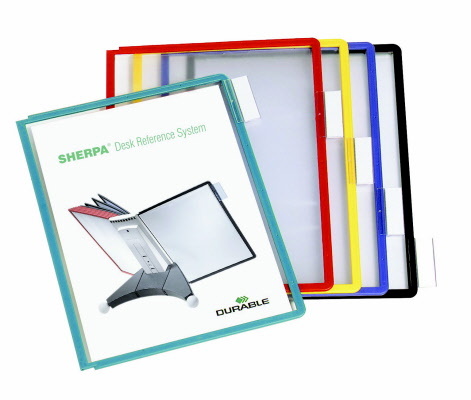 Durable - Sherpa Office Products catalog racks and Desk reference systems are just that - Durable! 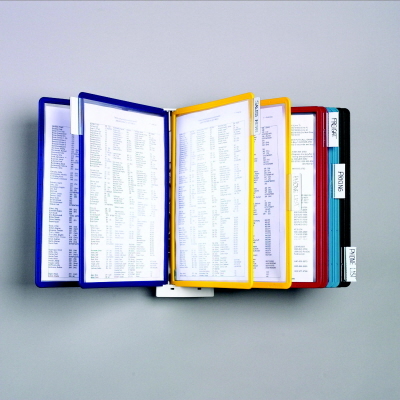 Quickly store and find your commonly used data and sheets which are protected in a polypropylene protector. 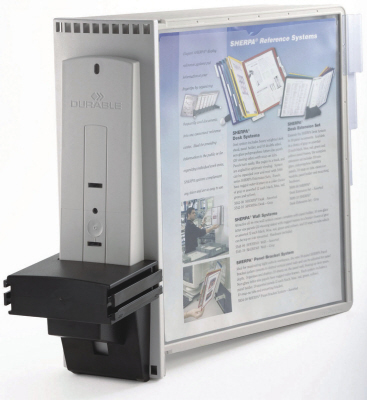 Durable Sherpa catalog reference systems can be expanded, stored on the desktop or mounted to a wall for easy access of information when you need it, where you need it! 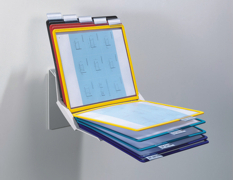 A practical and professional way to keep important presentation and reference documents readily available. Use a DURABLE SHERPA® Reference System for Switch Boards, in General Offices, Customer Service, Sales Departments, Mail Rooms, Warehouses, Machine Shops, Factories, Garages, Canteens, Restaurants, at Car rental Agencies, Travel Agencies, in Data Processing, or at Banks. The possibilities are endless. 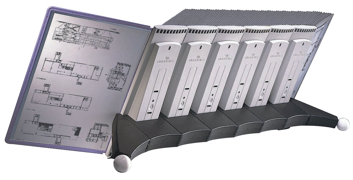 OREweb.ca® carries a full line of Durable catalog and reference systems including the Sherpa Motion, Vario Pro, Vario Wall, Desktop and Extension Catalog Racks, and Panel Bracket Systems. 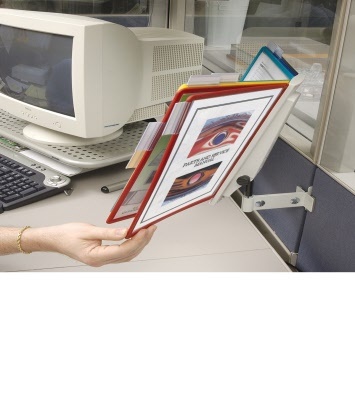 An attractive reference system - The Sherpa Durable Desk Top 5542-10 or 5542-00 catalog rack reference system includes desk stand with weighted legs and 10 heavy gauge polypropylene panel sleeves (20 viewing sides) with reinforced borders and 10 snap-on tabs. It can also be wall mounted with-out the legs attached, or expanded with the extension modules (below). Supplied with ten 1/5 cut snap-on tabs. Expand by adding 5541 systems side by side. Great for use in: Customer Service Centers, Sales Departments, Mail Rooms, Warehouses, Machine Shops, Factories, Garages, Canteens, Restaurants, at Car rental Agencies, Travel Agencies, in Data Processing, or at Banks. Expand the 5542 Durable SHERPA Desk Reference System in 10-panel increments as needed with the 5698 Extension Set. 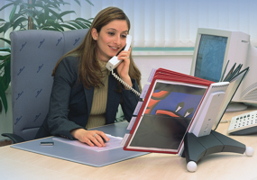 The 5698 does not include legs and is not a stand-alone system (see model 5542-10 or 5542-00 for base unit stand). It comes with a panel holder, 10 heavy gauge polypropylene panel sleeves (20 viewing sides) with reinforced borders, 10 snap-on tabs, and a module which extends the base of the desk stand. The Sherpa Durable Vario Pro 5515-00 allows for a mix letter-size portrait and landscape sheets set-up in one system. You can view-adjust for either format. Incredibly easy to use, the panel holder fluidly adjusts to the optimum viewing angle and rotates 360° around the base. 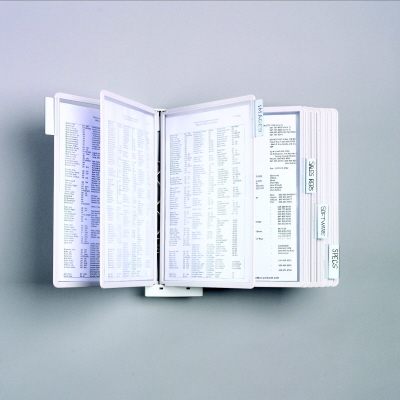 The system is supplied with 10 polypropylene letter size panels (20 viewing sides) and 10 snap-on tabs. 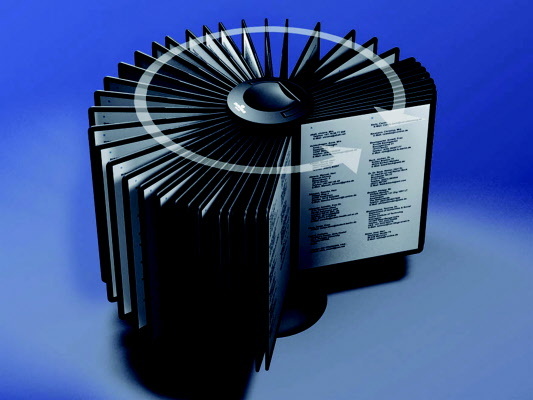 Reading angle adjusts between 25° and 70°. The Sherpa Motion frame is constructed with all metal parts. The Vario Pro can be either desk mounted or wall mounted quickly and easily! 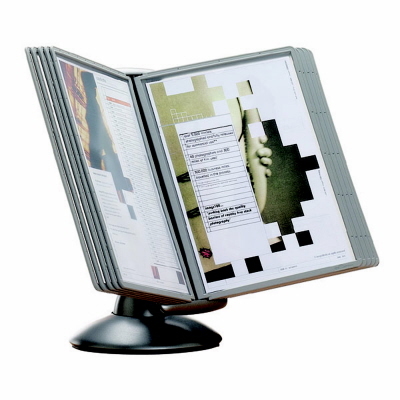 Complete wall mount SHERPA system 5541-10 or 5541-00 for displaying letter-size documents includes wall bracket, mounting hardware and 10 heavy-gauge double-sided polypropylene panels (20 viewing sides) with reinforced borders. DURABLE's elegant, fully rotational SHERPA motion 5539-37 reference system is the ultimate blend of style and function. The Sherpa Motion come in an elegant graphite finish constructed of sturdy solid metal. 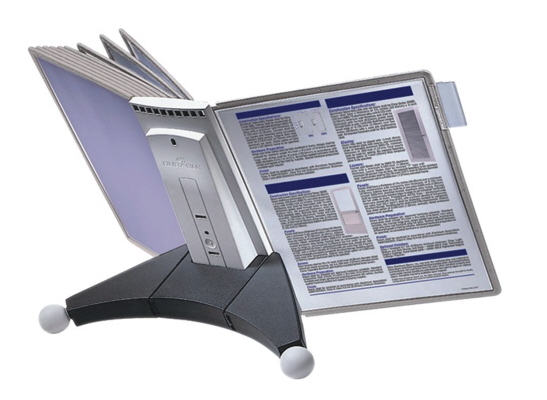 A practical and professional way to keep important presentation and reference documents readily available on the desk or counter top. A great way to maximize cubicle workspace, the Durable SHERPA Panel Bracket 5534-00 reference system. Displays 20 letter-size sheets and moves frequently used reference document from the desk to the panel wall. System includes panel bracket, panel holder, ten assorted border panels (two each black, red, yellow, dark blue, green), and ten snap-on tabs. 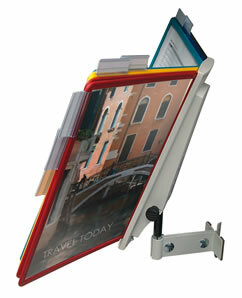 The panel holder rotates and tilts for optimum viewing. The bracket inserts onto a slotted panel rail and can be adjusted for panel depth. 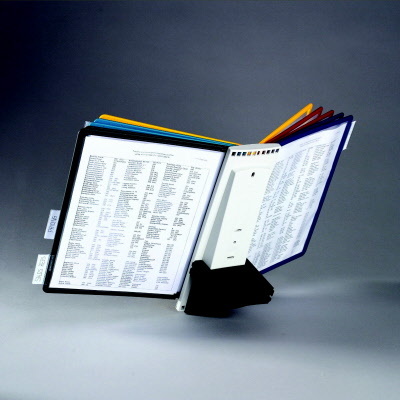 The SHERPA 5569-00 Articulate Arm Reference System puts reference information at eye level. 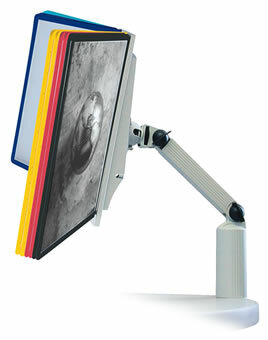 Arm can be raised or lowered for optimum viewing, extends up to 12 inches and rotates 360 degrees. Securely clamps to flat surfaces up to 3-1/2 inches. 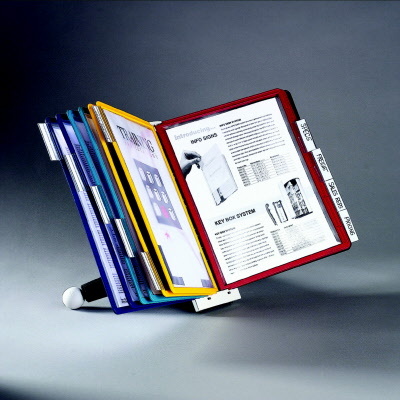 System includes 10 panels (20 viewing sides) with color assorted panel borders (2 each black, green, red, yellow, blue) and 10 snap-on tabs. 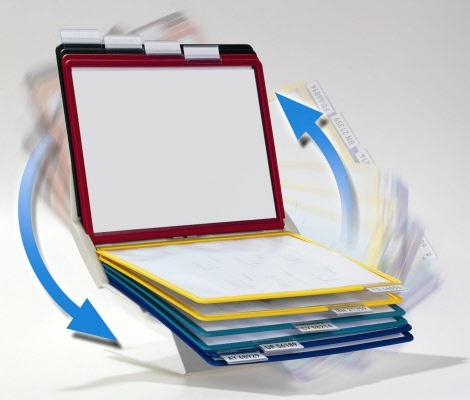 A practical and professional way to keep important presentation and reference documents readily available. Use a DURABLE SHERPA Reference Systems for Switch Boards, in General Offices, Customer Service, Sales Departments, Mail Rooms, Warehouses, Machine Shops, Factories, Garages, Canteens, Restaurants, at Car rental Agencies, Travel Agencies, in Data Processing, or at Banks. The possibilities are endless. 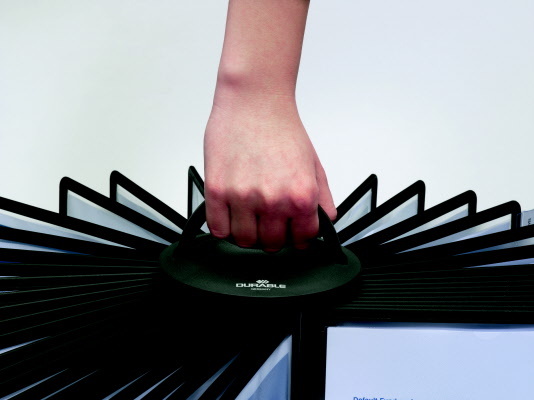 The SHERPA® Carousel 40 from Durable is the ideal solution for trade shows, showrooms, travel agencies and retail applications where customers browse for information. 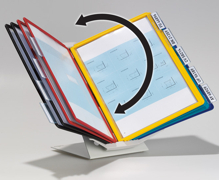 40 display panels provide 80 viewing sides for letter size sheets. 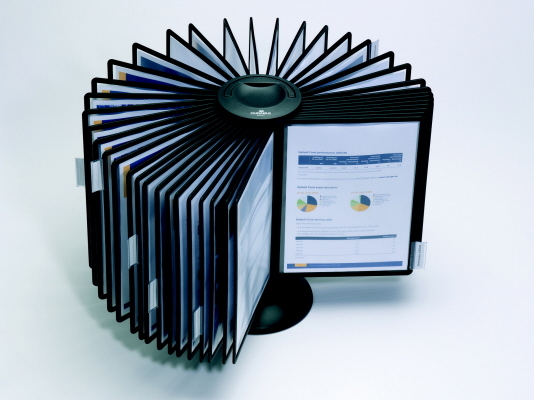 The Sherpa Carousel 40 panels have durable rugged molded black borders and revolve effortlessly on pipe stand for easy browsing. The stable, heavy base has a rubber pad to prevent slipping and surface scratching. The handle, which lays flat when not in use, enables turning and makes it easy to move the carousel from place to place.